Inspired by Thermotherapy and Kinesiotherapy, this anti-inflammatory roll-on has been specially designed to treat chronic pain including backaches and neck pain. 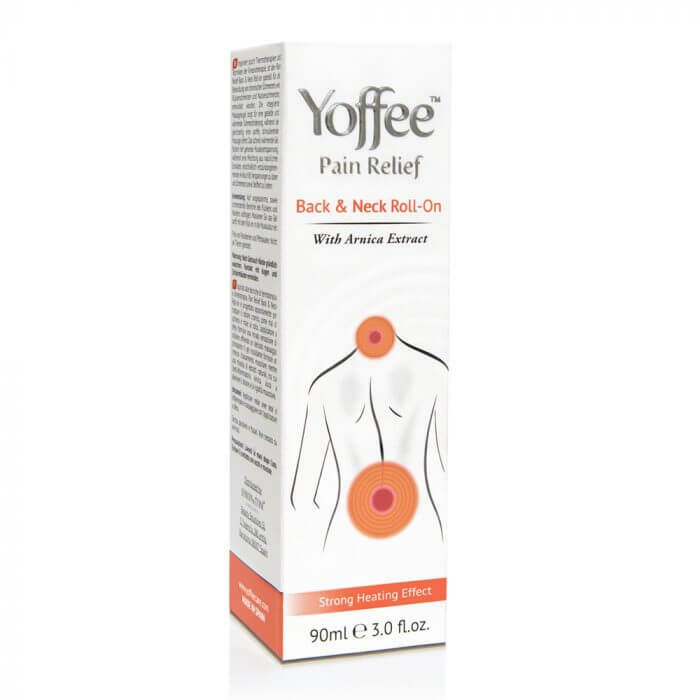 Inspired by Thermotherapy and Kinesiotherapy, Yoffee Pain Relief Roll-on is specially designed to relieve muscle tension, joint pain, strains and sprains. Thanks to its massaging roller ball, it allows you to massage easily the painful and tense areas while avoiding any contact with the hands. The fast warming feeling promotes relaxation of the muscles while the blend of natural extracts such as anti-inflammatory Arnica helps to release joint and muscle tension, alleviate pain and stiffness and restore flexibility. Apply the gel to the sensitive areas (back, neck, etc.) to relax. Massage prolonged (at least 5 minutes) for optimal effectiveness and as long as desired. Wash your hands after application in case of contact with the gel. AQUA(WATER), PROPANEDIOL, GLYCERIN, GLYCINE SOJA (SOYBEAN) OIL, ARGANIA SPINOSA KERNEL OIL, PHENOXYETHANOL, HYDROXYETHYL ACRYLATE/SODIUM ACRYLOYLDIMETHYL TAURATE COPOLYMER, SQUALANE, VANILYL BUTYL ETHER, ALCOHOL DENAT(ETHANOL), FRAGRANCE (PARFUM), PROPYLENE GLYCOL, EUCALYPTUS GLOBULUS LEAF OIL, PEG-35 CASTOR OIL, ETHYLHEXYLGLYCERIN, DISODIUM EDTA, GAULTHERIA PROCUMBENS LEAF OIL, ARNICA MONTANA FLOWER EXTRACT, POLYSORBATE 60, AESCULUS HIPPOCASTANUM (HORSE CHESTNUT) SEED EXTRA, CINNANOMUM ZEYLANICUM LEAF OIL, RUSCUS ACULEATUS ROOT EXTRACT, SORBITAN ISOSTEARATE, MENTHA ARVENSIS LEAF OIL, TOCOPHEROL, SORBITOL, POLYSORBATE 20, SODIUM LAURETH SULFATE, ISOMALT, RETINYL PALMITATE, INOSITOL, CALCIUM PANTOTHENATE, LINOLEIC ACID, ZINGIBER OFFICINALE ROOT OIL, CENTELLA ASIATICA FLOWER/LEAF/STEM EXTRACT, BIOTIN, CI 18050(ACID RED 1), LECITHIN, ARGANIA SPINOSA CALLUS CULTURE EXTRACT, SODIUM BENZOATE, LINALOOL, BENZYL BENZOATE, CINNAMIC ALCOHOL, EUGENOL, LIMONENE.